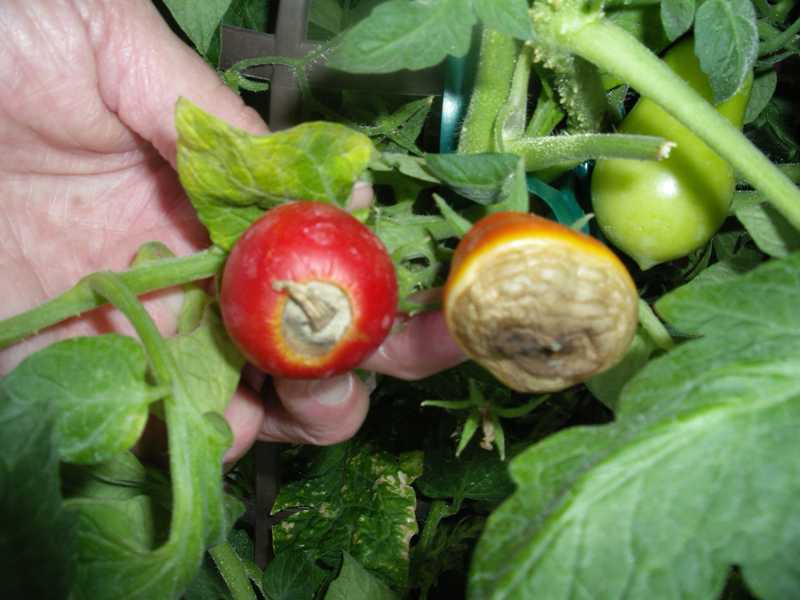 Blossom-end rot is a physiological disorder of tomatoes and peppers. It is a disturbance in the normal physiology of the plant. Because it is not caused by an insect or disease organism, fungicidal and insecticidal sprays are not effective in controlling the problem. 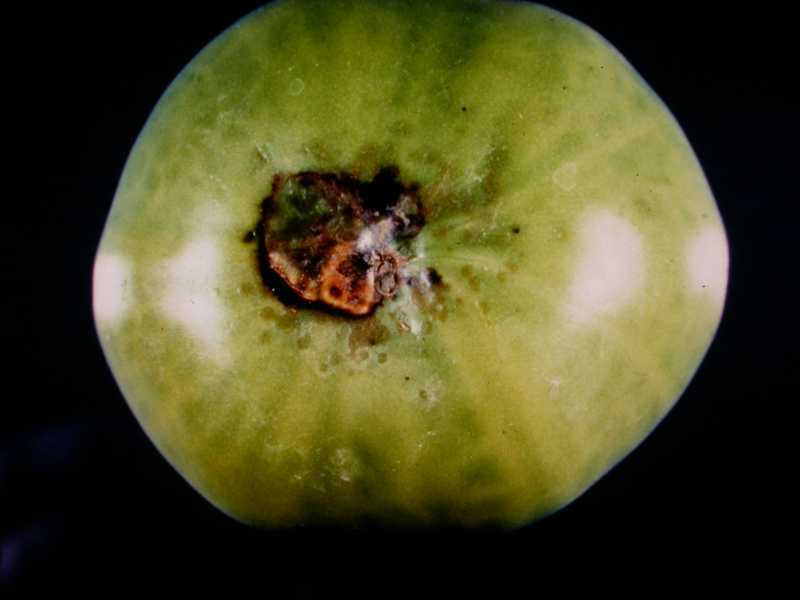 An early symptom of blossom-end rot is a light tan patch on the blossom end of the green fruit. 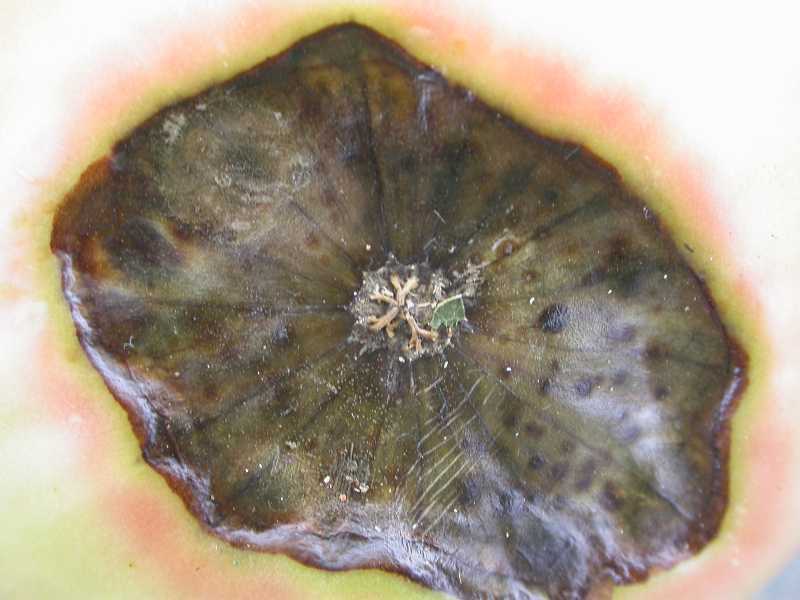 Over time the area turns dark brown or black and may become sunken or leathery. Fruit which is one-third to one-half developed is most commonly affected. 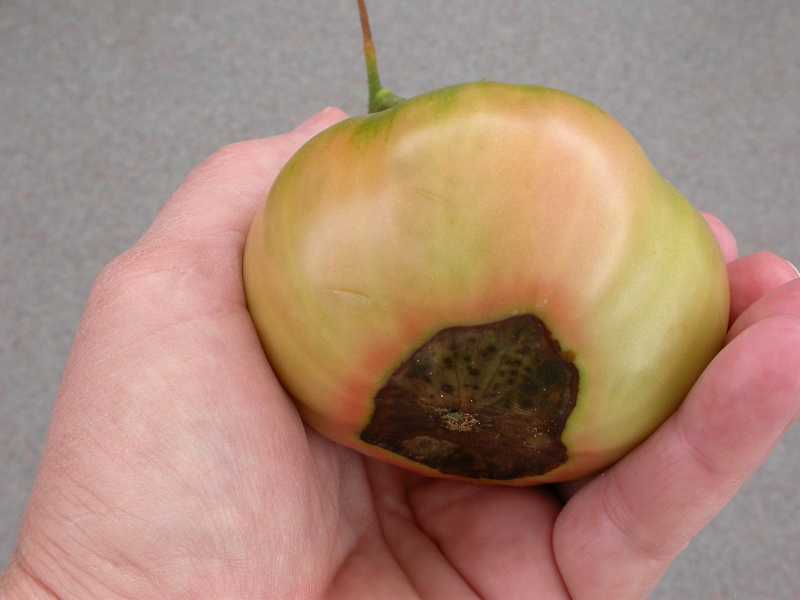 Sometimes an internal black rot will develop in the center of the fruit with little or no external symptoms. 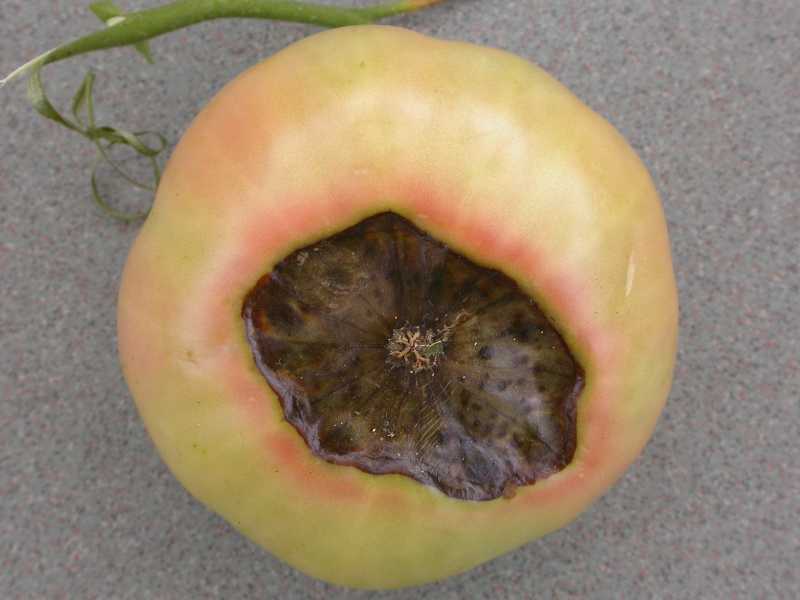 Parts of the fruit not affected by blossom-end rot may be eaten. 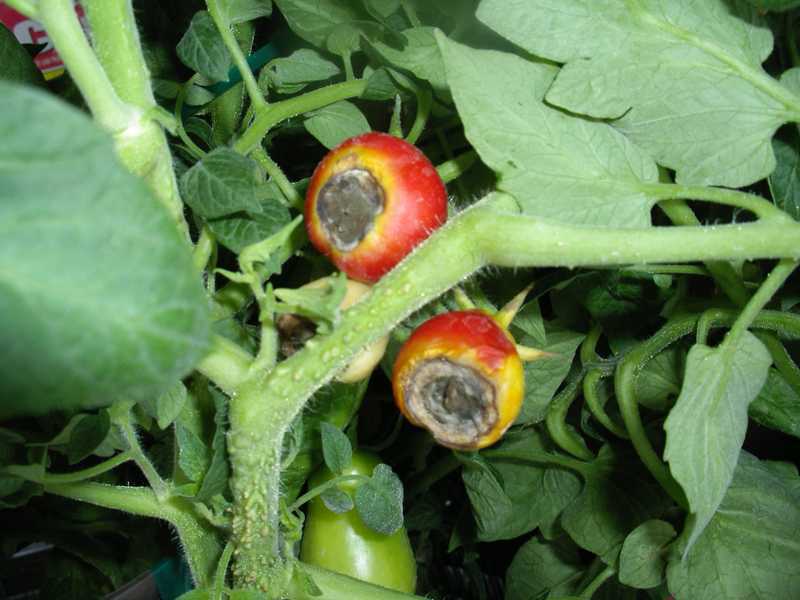 The most common cause of blossom-end rot is fluctuating soil moisture. Moisture plays an important role in calcium uptake in the plant. When a dry period follows adequate moisture, calcium uptake can be reduced. Root damage due to deep cultivation or burning from improper fertilization can also restrict calcium uptake. Excessive applications of fertilizer containing ammonia can also result in symptoms. Less frequently, an actual deficiency of calcium in the soil may cause this rot. This is rarely the case in St. Louis. 1. Maintain even soil moisture. Water regularly during dry periods and mulch plants with a 3–4 inch layer of organic material to help hold in soil moisture. 2. Avoid deep cultivation too near plants. 3. Modify your fertilizing practices. Use a fertilizer high in superphosphate and low in nitrogen. When adding nitrogen, use calcium nitrate rather than ammonia or urea forms. 4. Get a soil test. If the above methods do not correct the problem, get a soil test and maintain soil pH at 6.5 to 7. 5. As a last resort, use a foliar spray of calcium chloride. Do not spray too often or in excessive amounts. 6. Tomatoes in container. For tomatoes grown in containers, apply a fertilizer specifically formulated for tomatoes. The fertilizer must contain micronutrients including calcium. Strategies 1, 2, 4 and 6 are strictly organic approaches. Organic preparations of calcium chloride (mentioned in Strategy 5) that carry the Organic Materials Review Institute (OMRI™) seal of approval are available.